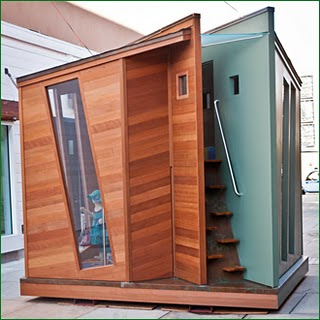 (above) The GyMAZEium from Peterson Architects.....While its a playhouse, I do love some of the off-kilter, daring lines in its design, and the alternating, space-saving steps. 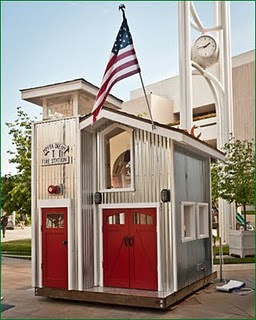 Even though these are playhouses, there are still MANY ideas that can be pulled from them for adult/real-home applications. It's that time of year again! Fundraisers are in full swing. A total of 15 playhouses will be auctioned off supporting Rebuilding Together Peninsula. 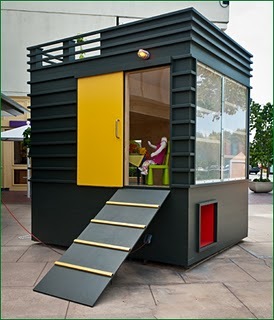 Playhouses are currently on display at Stanford Shopping Center Palo Alto, California. The Dreams Happen Auction and Gala will begin at 6:30 June 4th. See the Rebuilding Together Peninsula site for tickets and more information. This years houses are topnotch! It was almost impossible to narrow down a few to show.